The 21st century has seen a resurgence of interest in the works of Stefan Zweig, who was amongst the most acclaimed and widely-read authors worldwide before he fell into obscurity. Mark Gelber (Ben Gurion University) and Birger Vanwesenbeck (SUNY) present two recent volumes that assess Zweig’s legacy from new perspectives. Gelber and Vanwesenbeck co-edited the forthcoming Stefan Zweig and World Literature: Twenty-First-Century Perspectives (Camden House, March 2015), which is the first critical study of Zweig in English to appear in North America in over 25 years. The essays in the book place Zweig outside the narrow European context in which he has traditionally been confined and trace the outlines of a new image of Zweig that is emerging among a global readership. Gelber’s monograph, Stefan Zweig Judentum und Zionismus (StudienVerlag, 2014) is the first study to place Zweig squarely in a Jewish context. Mark H. Gelber, born in New York City. Ph.D. Yale University. Professor of Comparative Literature and German-Jewish Studies, Ben-Gurion University of the Negev, Beer Sheva. Director of the Center for Austrian and German Studies, BGU. Elected 2001 Member of Academy for German Language and Literature (Darmstadt). Guest Professor at University of Pennsylvania, Universität Graz, University Maribor (Slovenia), Yale University, Universiteit Antwerpen, RWTH Aachen, Auckland University (New Zealand), and NYU. Author or editor of 15 books, 80 scientific papers,180 conference lectures and university seminars. Published on Heine, Börne, Freytag, Mann, Herzl, Nordau, Buber, Brod, Kafka, Joseph Roth, Nelly Sachs, Elias Canetti, Jakov Lind, Ruth Klüger, etc. Initiated and co-organized the first international Stefan Zweig Congress in Salzburg in 1992. 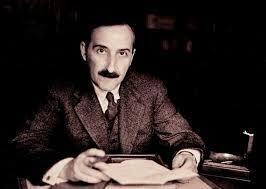 Co-organizer of the international conference to be held in Salzburg in 2015: Stefan Zweig und das Judentum. Birger Vanwesenbeeck is Associate Professor of English and Graduate Coordinator at the State University of New York at Fredonia. He is the coeditor of William Gaddis: ‘The Last of Something’ (McFarland, 2009) and has published extensively on twentieth and twenty-first-century American literature. His essays and book reviews have appeared in Postmodern Culture; Mosaic; Pynchon Notes; the Journal of Austrian Studies; and the Electronic Book Review. He serves as the current editor for the “Fictions Present” thread of the Electronic Book Review; and he is also an editorial board member of the Britain-based journal Orbit: Writing around Pynchon. He is currently completing a book manuscript entitled “The Art of Mourning” which investigates the strategic triad of ekphrasis, mourning, and lateness within the American literature of the 1950s and early 1960s.